There are three fundamental variations of the Stirling engine. All three have two pistons but these work in different ways in the variations. 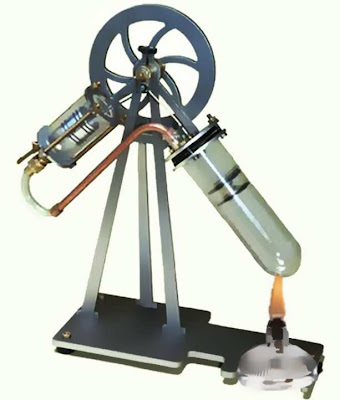 The Alpha type Stirling engine has TWO power generating pistons. 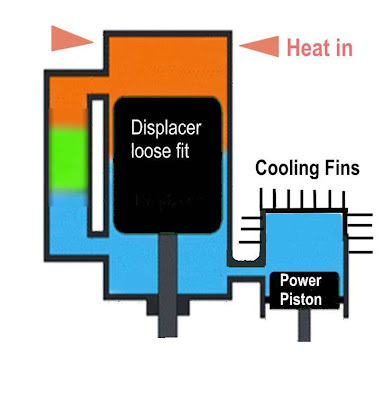 The two pistons are in separate cylinders, one hot and one cold. The Alpha configuration has a high power-to-volume ratio. It also has problems with seals and lubrication due to the high temperature of the hot piston. The hot piston generally has a hefty insulating head which adds inefficiency. The Beta type Stirling has only a single POWER piston. This is fitted in the same cylinder on the same shaft as a second piston called a displacer. 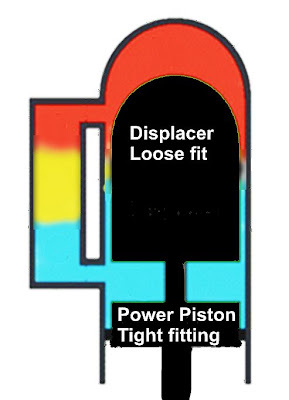 The displacer piston fits loosely in the cylinder and does not generate any power. It's sole purpose is to shuttle air / gas from the hot side to the cold side. 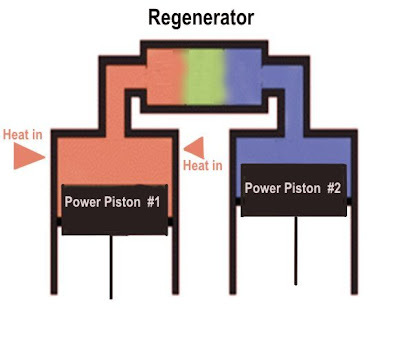 When the working gas is pushed to the hot end of the cylinder it expands and pushes on the power piston. 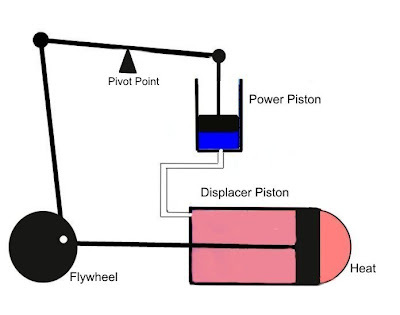 When it is pushed to the cold end of the cylinder it contracts and the momentum of the machine, assisted by the flywheel momentum, pushes the power piston the other way to compress the gas. The beta engine avoids the difficulties of hot moving seals. The Gamma Stirling is a Beta Stirling with the power piston mounted in it's own separate cylinder. The hot air/gas flows between the two cylinders as a single body. The Gamma configuration produces a lower compression ratio but has the advantage of being simpler and is often used in multi-cylinder engines. In the next post on Stirling, I will be looking at some of the interesting applications and variations of the engine.